The most important aspect of air quality in closed rooms like homes, schools, recreational buildings, restaurants, public buildings, offices is the purity of air. Stale or impure air reduces well-being and impairs productivity or efficiency of work procedures and production processes. The quality of air inside a building depends on the concentrations of contaminants and it is essential to monitor indoor air quality (IAQ) for occupant’s health, productivity and comfort. Humans exhale CO2 when breathing. The more people you have in a small room for longer periods of time, the higher levels of CO2 you’re going to get. That is why CO2 measurements can be used to determine whether a building has appropriate ventilation. Or, to put it simply, if there’s enough fresh air coming inside to keep everyone healthy. And while high CO2 levels can tell you when your rooms aren’t getting enough fresh air, high CO2 levels alone don’t cause discomfort, bad smells and health problems such as headaches that we feel when the air “gets bad”. The real cause is hidden in the build-up of contaminants when the air gets bad. Here’s where measuring Volatile Organic Compounds (VOCs) comes in. VOCs are gases that are emitted in the air we breathe from different materials. Many commonly used products can be the sources of these compounds including building maintenance and cleaning products, paints, adhesives, sealants, carpets, drywall, and insulation materials, among others. 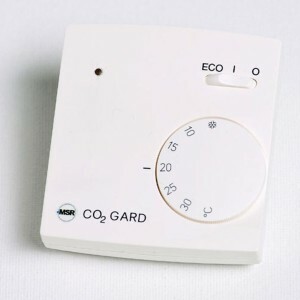 The normal CO2 values may not cause any problems in closed areas but VOC can be responsible for symptoms like eye irritations, headaches, feebleness, dizziness, as well as diseases. Hence VOC measurement is the perfect method to define air quality. VOC monitoring can also provide significant benefits such as cost savings from reduced raw material use and reduce leaks. Our Indoor Air Quality detector (IAQ) is a simple, low-cost and low-maintenance CO2 + VOC transmitter based on modern bio-semi-conductor technology. The transmitter detects the CO2 + VOC content in air and emits a proportional, linear, analog 0-10 V or digital RS 485/ModBus signal.